(Charlestown, Nevis–Thursday. 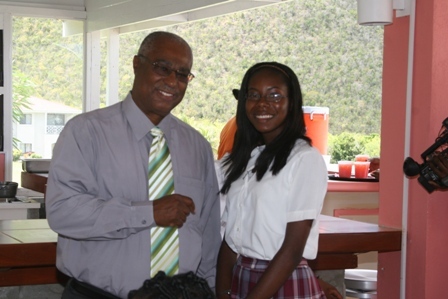 April 14th , 2011) Sixth Form students in Nevis made the call for laptops and the Premier of Nevis and Minister of Education, the Hon. Joseph Parry responded with a statement on Thursday that they would receive the devices as early as next week. He made the announcement at his Bath Hotel office on the heels of the distribution of hundreds of laptops by the Department of Education under the Federal One-to-One Laptop Programme with the assistance of the Premier and Attorney General Hon. Patrice Nisbett. “I am pleased that the island has gotten the first set of laptops from Taiwan for the 5th form students and since then, requests have come in from 6th Form students for laptops. The Nevis Island Administration has since sourced a sponsor for the extra laptops to assist the 6th formers with upcoming exams and research,” commented the Premier. According to the Premier, the feedback was that they were of very good quality and other students who have seen them were looking to receive similar models. The Premier said the present Sixth Form College students were bursting with energy, were very up to date on the issues and have shown tremendous interest in current affairs. “The Sixth Form students have shown interest in academic work and a strong wanting to go to University and we have been able to stimulate them and stir them up in that direction,” said the Premier. Mr. Parry and his Nevis Reformation Party (NRP)-led Cabinet had recently met with Sixth Formers at a luncheon the future leaders of Nevis were able to ask questions and make suggestions. The Cabinet had also consulted with the island’s youths at a recently held Youth Forum in an effort to listen to their needs, questions and comments.